January 30, 2014  The appeals court in Florence found Knox and her ex-boyfriend guilty of the 2007 murder of Meredith Kercher and sentenced her to 28 1/2 years in prison. 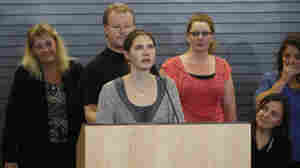 Knox currently lives in Seattle, and the sentence is likely to set up a long battle over her extradition. August 26, 2013  Amanda Knox, whose murder conviction was overturned in 2011, will not travel to Italy for a new trial in the death of fellow student Meredith Kercher. A spokesman for the Knox family tells CNN that Knox's presence isn't required at next month's trial. February 16, 2012  Amanda Knox, the U.S. college exchange student who won an appeal to overturn her murder conviction in Italy last October, has signed a deal to write a memoir — for which she'll earn nearly $4 million, according to reports. Arline Kercher and Lyle Kercher, the mother and brother of murder victim Meredith Kercher, on Monday in Perugia, Italy. October 4, 2011  Meredith Kercher's brother says her family feels as if it's now "back to square one." Knox is expected to be home in Seattle later today.